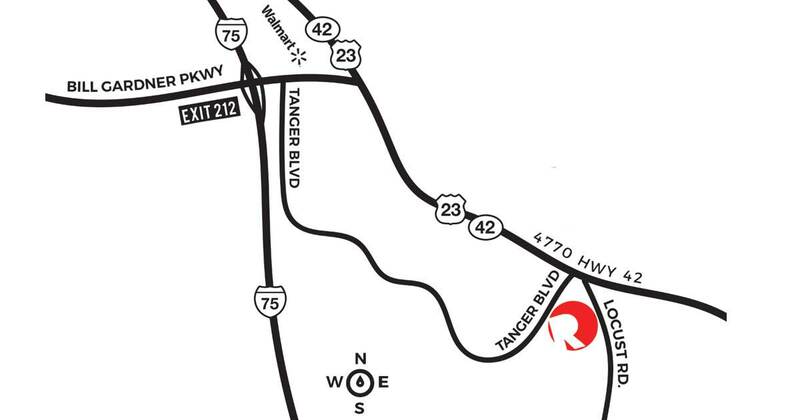 Relevant Church is located at 4770 Highway 42 in Locust Grove (corner of 42 and Tanger Boulevard; map link above). TEXTSundays at 8:30am, 10:00am, & 11:30am. Worship experiences last approximately 60-65 minutes. Relevant YOUTH meets Wednesdays at 6:45pm (middle and high school students). Take exit 212 and turn left onto Bill Gardner Parkway. Take a right onto Tanger Boulevard and Relevant is approximately 3 miles down on the right. Take exit 212 and turn right onto Bill Gardner Parkway. Take a right onto Tanger Boulevard and Relevant is approximately 3 miles down on the right. Take Highway 42 North. Relevant is located on the corner of Highway 42 and Tanger Boulevard as you enter Locust Grove. Take Highway 155 North to Bill Gardner Parkway and turn right. After you cross under I-75, take a right onto Tanger Boulevard and Relevant is approximately 3 miles down on the right.